Chitose and Kasagi were built in the USA, at the Union Works shipyards in San Francisco and at Cramp in Philadelphia. These were enlarged versions of the Takasago built in UK. Both served during the Battle of the Yellow Sea and at Tsushima, being hit hard. 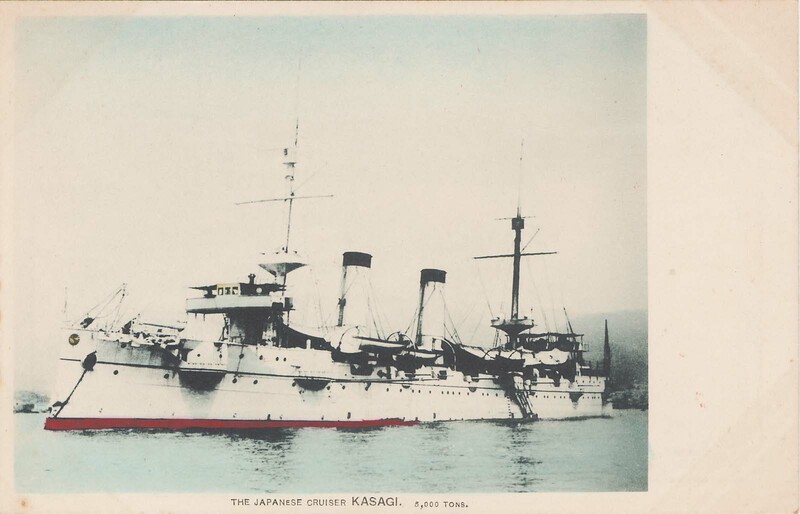 The Kasagi was used from 1910 as a training ship and was lost on reefs in 1916 in Tsugaru Strait, and Chitose served as coastguard from 1922, stricken later and was sunk as target in 1931. These ships were the second major capital warships to be ordered by the Imperial Japanese Navy from an American shipbuilder, but also last to be ordered from an overseas shipyard. In their basic form, they were to be enlarges version of the previous Takasago, 1898 design by Armstrong Whitworth, but the same armament, less the torpedo tubes. 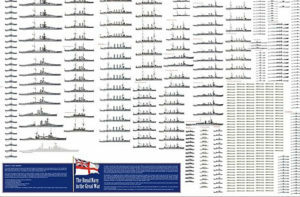 Also both ships diverged in their compartimentation, the British design having 109 watertight compartments versus 130 on the new cruisers. Chitose was better known in her later form, a seaplane tender later converted as a light aircraft carrier during WW2; However her 1898 counterpart’s lauch was filmed by Thomas Edison, one of the earliest ship launch ever filmed. The launched ceremony was made to be moving, with the Governor of California and San Francisco mayor and their niece and wife respectively christening the ship and launched her. The Japanese Consul explained “Chitose” signified “thousand years of peace”, while a flock of white doves was released in support of the ceremonials. At 4,836 t (4,760 long tons), for a length of 115.3 m (378 ft 3 in) w/l, a beam of 15 m (49 ft 3 in) and draft of 5.4 m (17 ft 9 in) the Kasagi class was generous for a protected cruiser. The installed powerplant of two shafts VTE (Vertical Triple Expansion engines) was fed by 12 boilers for a total of 11,600 kW (15,600 hp) as designed, and a top speed of 22.5 kn (41.7 km/h; 25.9 mph), with a range of	4,000 nautical miles (7,400 km; 4,600 mi) at 10 knots (19 km/h; 12 mph). 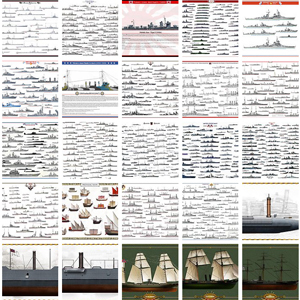 The crew comprised 405 sailors and officers. The armament comprised two 20.3 cm/45 Type 41 naval guns (8 in), ten QF 4.7 inch Gun Mk I–IV guns (113 mm), twelve QF 12-pounder 12 cwt naval guns (75 mm), six QF 3-pounder Hotchkiss guns (20 mm) and four 356 mm (14.0 in) torpedo tubes. Protection was adequate, with on deck 112 mm (4.4 in) on slopes and 62 mm (2.4 in) armour thickness on flat surfaces, while the Gun shield were 203 mm (8 in) thick to 62 mm (2.4 in) of the sides and the Conning tower was 115 mm (4.5 in) strong. The cruiser was named after Mount Kasagi, a holy mountain outside Kyoto. 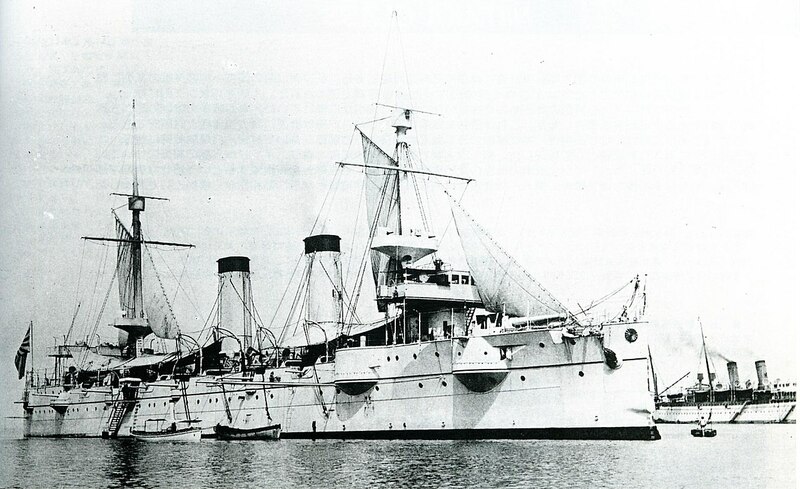 She was built at William Cramp and Sons, Philadelphia and funded by the 1896 Emergency Fleet Replenishment Budget, largely fed by Chinese war reparations after the 1894 treaty of Shimonoseki. 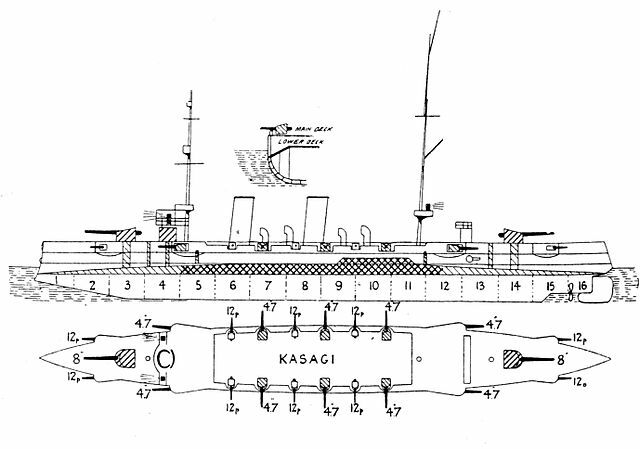 The Kasagi began her carrer, still unnamed, to a naval review at Philadelphia to celebrate the end of the Spanish–American War, and sailed directly to UK to receive her British-built Armament. She then joined Yokohama to be properly fit for service and listed as such. During Kagoshima Bay manoeuvers in the fog she collided with a steamer (which was beached) but completed her exercizes. The same year in 1900, she joined the international fleet deployed during the Boxer rebellion, supporting Japanese naval landing forces to occupy the port city of Tianjin. In 1901 she visited Vladivostok. In 1904, she partcipated in the Battle of Port Arthur. On 9 February 1904, she was part of the 3rd Cruiser Squadron and duelled with the Russian ships at the entrance taking some minor damage. She later shelled Vladivostok under Admiral Kamimura Hikonojō orders. She also rescued battleship’s Hatsuse crew after the battleship had struck a mine, rebuffing Russian destroyer by her artillery at the same time. 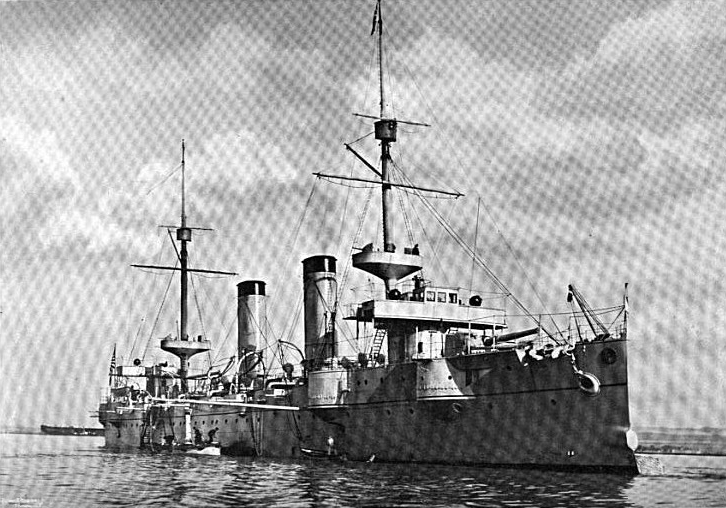 At the Battle of the Yellow Sea on 10 August, she duelled and damaged the battleship poltava and chased off the cruisers Askold and Novik. Eventually at the Battle of Tsushima under the banner of Admiral Dewa’s 3rd Division, she fired the first shot on the battle, engaging the battleship Oryol and then the cruisers Oleg, Aurora, and Zhemchug. However she was badly hit below the waterline, which flooded a boiler room and coal bunker, with one KiA and nine wounded. She was forced to retire to assess the damage. 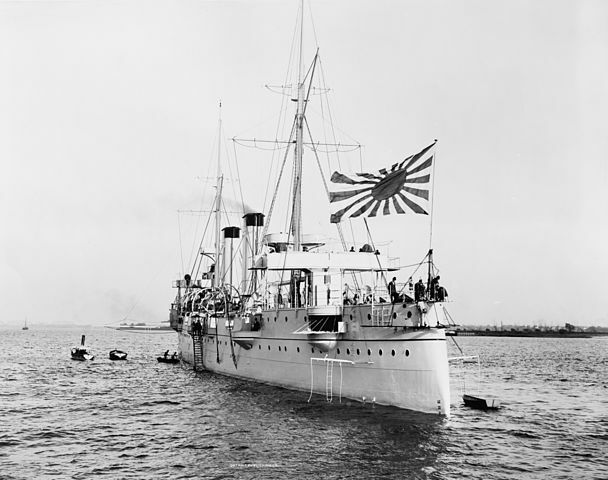 In 1908, the cruiser participated in the first large-scale post-war fleet maneuvers of the IJN, and was reclassified as a training ship. She sailed to Hawaii for her first cruise in this quality, and in 1912 made a passage in drydock to receive new Miyabara boilers and other minor modifications. During WW1 she was a training vessel attached to the Japanese 1st Fleet and did not see action. However in 1916 she ran aground in heavy weather in the Tsugaru Strait, the reefs making a considerable breach that cannot be repaired. It was decided to retreive most of the heavy equipments, guns and evacuating the crew, and she was filled with explosives and sank on 10 August. She was struck from the list in November of that year. 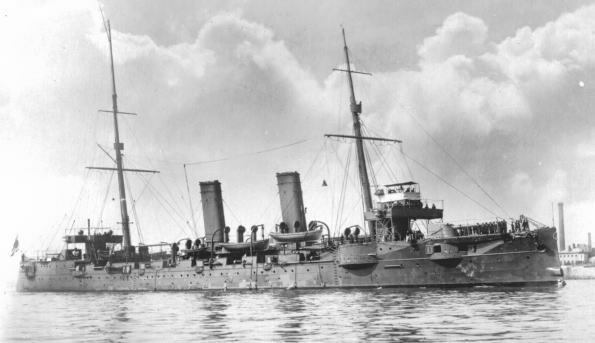 Chitose arrived at Yokosuka Naval District on 30 April 1899, accpted into service with the IJN. She fought in the Russo-Japanese War, expecially at the Battle of Port Arthur as flagship of Admiral Dewa Shigeto. In February 1904 whe operated with the 3rd Cruiser Squadron against the Russian fleet at the entrance to Port Arthur. She duelled with the cruisers Askold and Novik, and sank a Russian destroyer a few days later. At the Battle of the Yellow Sea (10 August) she chased the cruisers Askold and Novik, and then turned to pursue the Novik off Hokkaido/ The Russian cruiser was later sank at the Battle of Korsakov in August. At the Battle of Tsushima, Chitose and the rest of the 3rd Division engaged the Oleg, Aurora, and Zhemchug. Kasagi then carried Admiral’s Dewa mark, which was transferred oon the Chitose after the former was damaged. The day after Chitose sank a Russian destroyer, and chased the cruiser Izumrud. Afterxwards the Japanese cruiser covered Northern Korean landings and returned to Maizuru Naval Arsenal. Placed in drydock she was repaired at the end of July 1905. Before WW1, Chitose made a round trip with her sister ship IJN Tsukuba, first, attending the Jamestown Exposition of 1907 and 300th anniversary celebrations of the founding of the Jamestown Colony in the US, then Europe. There was an extensive overhaul in 1910: He old locomotive-style boilers were replaced by proper naval Miyabara boilers. 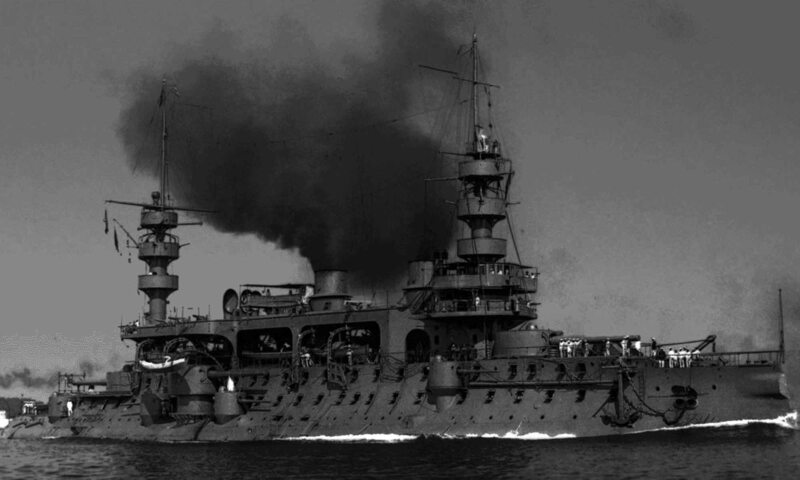 from 1914 Chitose was assigned to the 2nd Fleet. She participated in patrols of between Singapore and Borneo, chasing potential German commerce raiders and U-boats, in conformity with the Anglo-Japanese Alliance. The rest of the war was spent without incident or fact worthy of notice. IJN Chitose became a 2nd class coastal defense vessel on 1 September 1921, partially disarmed. Chitose was Declaredobsolete on 1 April 1928 she was struck from the list became hulk Haikan No. 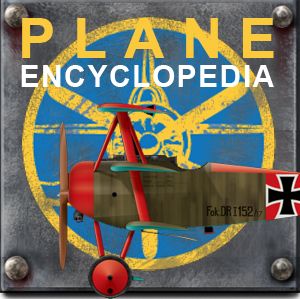 1, and was sunk on 19 July 1931 off Shikoku island as a target for dive bombers. 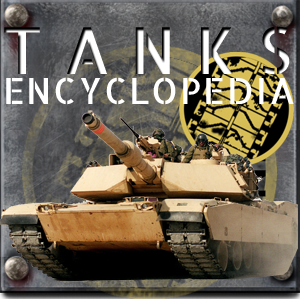 Armament: 2x 203 mm, 10x 120 mm, 12x 76, 6x 45mm, 4x 457mm TT sides, fore et aft.